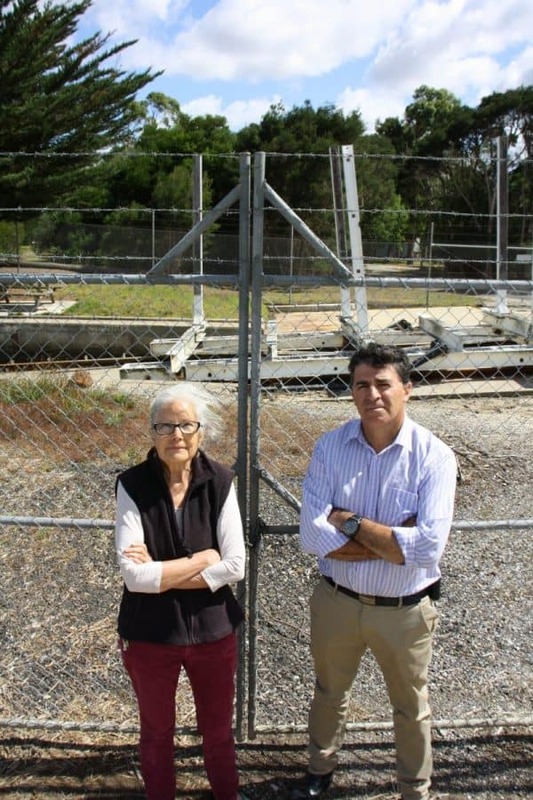 • Not happy: the planned closure of the Port Franklin slipway, something that has existed in the town since around 1875, is being opposed by Port Franklin local Jan McPhee and SGSC’s Cr Ray Argento. GIPPSLAND Ports’ planned closure of the Port Franklin slipway has been met with anger by locals. A community meeting has been scheduled at the Port Franklin Hall for Sunday, February 20 at 6.30pm to discuss how to best fight the closure. The news of the decision, which is scheduled to take effect on May 31, was delivered to boat owners via a letter from the Port Franklin Public Purposes & Recreation Reserve Committee of Management. The community group – which had been running the boat repair and maintenance facility – informed recipients that the decision came from the Department of Environment, Land, Water and Planning (DELWP) and Gippsland Ports. Fisherman Wayne Cripps, whose family first came to Port Franklin in 1874, said a slipway was one of the first pieces of infrastructure built in the town – about a year after the Cripps clan landed. First constructed at the end of Franklin Road, it was later moved – about 70 years ago – to its current site at Fisherman’s Way. “Wherever there’s a marine, there’s a dry dock for boat maintenance and repairs. The trouble is that the facility has been downgraded from its original 15-ton capacity to 4.2 ton today,” he said. “The lack of maintenance of the slipway over the years means it does not have the appropriated tonnage capacity. Most of the boats around are in excess of four ton, which means it can’t be used by them. Mr Cripps said he approached DELWP in 2016, with an offer to purchase the slipway. His plan was to upgrade the facility, making it a viable facility. He followed up the request with a letter to the relevant Minister. Late last year he received a reply from the Minister’s office, saying the offer was under consideration. He has heard nothing since. “I really don’t care who owns it, but we need a slip yard. It’s not about making a stack of money. The Port Franklin community needs it,” he said. While Port Franklin’s slipway generally requires two people to operate it, Mr Cripps said, the next closest, at Port Welshpool – which has a 70-ton capacity – would more typically have five workers in attendance. Not surprisingly, given its big boat status and paid workforce, it is far more expensive. Port Franklin Hall Committee president Jan McPhee, a fierce advocate for the slipway, said the facility’s loss would leave the local fishing community high and dry. “This is a fishing port. So where will the fishermen then take their boats if they need them serviced? As you can see there’s plenty of boats here,” she said. She said there had never been any doubt that the facility could be run by local volunteers. Cr Ray Agento said the facility, which sits on DELWP-owned land, would be returned to its original state, with all remnants of the historic slipway taken away. “Council’s view is that if Gippsland Ports was to withdraw from the slipway, then other options should be looked at, whether private enterprise or management by another committee,” Cr Argento said. Who takes over the slipway will be the main point of discussion at the meeting, Cr Argento said. The important thing is to make sure it is still around after May 31. “We’re hoping some younger people will be putting their hands up at the meeting, so they can have a voice in how Port Franklin is shaped in the future,” he said. For information on the community meeting call Jan on 0400 329 675.